The ADJ Mega Par Profile is a compact, low profile par can designed for uplighting, lighting up stages and will bring color and excitement to any party. This Par Can is intelligently designed so that it may sit directly on the ground or inside truss without the hanging bracket because the power & DMX Ins and Outs sit on the side of the fixture, not on the rear. The Mega Par Profile offers smooth RGB Color Mixing, has a 30-degree beam angle, 6 operational modes (including DMX, Sound Active and Master/Slave), and has 7 DMX Channel modes for a variety of programming options. Users can also use the ADJ LED RC wireless remote, which is sold separately, to control the Mega Par Profile. Considering purchasing the American DJ Mega PAR Profile Black? Have questions? Ask people who've recently bought one. Do you own the American DJ Mega PAR Profile Black? Why not write a review based on your experience with it. This is an amazing light! Couldn't fault it, bright and worth every penny! bought 4 of them! and going to but more! Bought a couple of these for the music club, we use them resting on the floor and aim them at the drums for reflections off the chrome fittings and sometimes aim them at the singers. Hoping to buy a controller and a couple more and link them altogether. They area nicely finished and seem sturdy and reliable. This fixture is designed for uplighting and it does what ii is supposed to do perfectly!. However, if you are using this as a wash it can create RGB shadow and the wires (Power, DMX) tend to make the rig look messy because the inputs and outputs are on the sides of the fixture rather than the back. But other than that a great fixture!! I have now bought 4 of these in total. Use them for uplighting my scrims/walls/washing the dancefloor. They are BRIGHT!! Half the time I have to dim them down via DMX. Sound active mode is good if you don't want to DMX them. Brilliant light, very bright great light to colour wash your dance floor also very good for up lighting. Great for uplighting walls in a venue but wouldn't advise for using as wash lights as the 10mm LEDs jsut arent bright enough. This is an excellent light for any size venue and any occasion. Creates the perfect atmosphere. 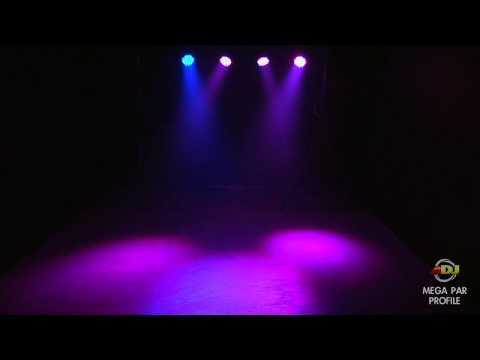 Awesome light for smaller stages. 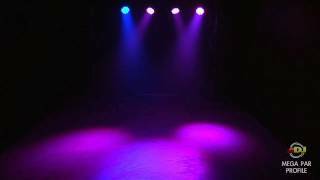 This is a lovely light for a smaller stage venue. This isn't very bright but good for uplighting. Seen a video for American DJ Mega PAR Profile Black online or have you own video? Check out American DJ Mega PAR Profile Black on DJkit.com!